Web design painting Chesapeake VA | Originally VISIONEFX provided the website design for Straight Line painting, then was redesigned when the business was acquired by MA Allen Painting. The new business owners asked VISIONEFX to keep the Google search engine ranking in tact while changing the name of the company without compromising the websites search ranking over Google. 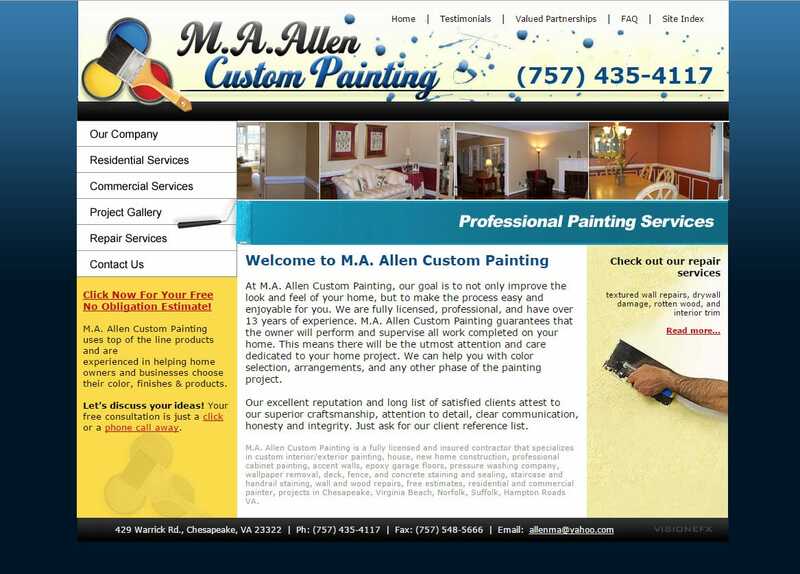 MA Allen painting offices are in Chesapeake, VA. When searching Web design painting Chesapeake VA look no further than the expert web design services of VISIONEFX. VISIONEFX serves business owners in Chesapeake VA. We provide extraordinary web design for small and large businesses throughout the United States to include; custom web design, web development, e-commerce web design, Word Press web design, Joomla web development, SEO and web maintenance services. Take a moment to read out Google My Business Reviews online. We take customer service seriously! It’s our mission to have you as a long term website client. We are vested to help you grow your business online; to help your website keep up with all the lastest changes in browser technology and Google algorithm SEO changes. Call: (757) 619-6456 or email us directly info@visionefx.net.